Did my ginger lime mandarin honey drink make you linger for summer? Well then I have an even more tropical drink for you to close your eyes and get the feeling you are lying on a beach with the sun giving that warming light we miss in wintertime. Slice the peeled mango’s and limes. Press the mango and lime pieces through your slow juicer. Do this slowly as mango takes some time to be juiced. Put the juice in a cooking pot. Halve the passion fruits and spoon the seeds into the mango-lime juice. Heat the juice with passion fruit seeds to boiling temperature. Let cool down to 75 degrees Celsius. Sieve the juice-seed mixture through a cooking sieve to get rid of the passion fruit seeds. Pour the juice in a glass bottle. Put the bottle in the fridge so the juice can further cook down. When completely cooled down, fill the juice in two glasses. Add some sparkling water and your juice is ready to drink! The juice will foam and look like a cocktail, but then without the alcohol :-). The taste of mango combined with passion fruit and a hint of lime is heavenly! What is better then a freshly squeezed ginger smell? Making a drink of it :-)! This is my first alcohol free alternative beverage of the year. I combined the juice of ginger root, lime and mandarin with some honey for this delicious summer feel drink. Peel the ginger, lime and mandarins and cut them in pieces. Press the pieces of ginger, lime and mandarins with your slow juicer. Put the juice in a pot to heat it together with the honey. The reason for heating to boiling temperature is that you can keep the juice longer. Alternatively you can dissolve the honey in some water by heating it and then add to the juice when cooled down. If you don’t have a slow juicer, press the lime and orange with an orange press. Slice the ginger and add the slices to the juice while heating it in a pot. The juice will extract the ginger taste by heating it up. After reaching the boiling temperature, cool the juice down to around 75 degrees Celsius and put in a glass bottle. Let further cool down by putting the bottle in the fridge. When completely cooled, pour some of the juice in two glasses. Add ice cubes and sparkling water. Taste to see if you need to add more juice or more sparkling water. The ginger taste is quite overpowering, and combines very nice with the lime. The mandarin and honey give the drink enough sweetness so the sourness of the lime is balanced out. Now enjoy this summer drink with the thought that the sugar content is much lower than what you find in a normal soda or juice! It is that that time of year again where a lot of people make their New Years resolutions … and yes, you guessed it right, I am one of them. I simply love New Years resolutions. Why? Because it gives me energy to think that I can start something from new. Kind of like being born again. It might have something to do with the fact that my birthday is in the start of January. So I have double chance of reflecting over the year that has gone and what to start putting my energy in for the next year. This year I will dedicate more time for my blog. It gives me such an energy to see that people read my blog and hopefully also getting some energy or creative ideas from reading my crazy home brew experiments or my nights out in Copenhagen. A very good friend of mine posted some ideas on her blog last year to write an even better blog. One of them was a weekly theme. That is exactly what I will try this year. It will not surprise you that the first weekly theme will be ‘Beer of the week’. My husband and me love to try new beers. Therefore it won’t be difficult to tell you something about a new beer every week. As we are subscribed to Belgisk Bryg, we get Belgian beers every month at our doorstep. Those will be perfect to start. Of course it won’t be only Belgian beers I’m talking about. Every interesting beer that we taste, is an optional winner for the ‘Beer of the week’ award. Another one of my New Years resolutions is to try to create healthy and tasty alcohol free alternatives. As I love juice and we try not to drink alcohol during the week days, this will for sure be an excellent way to get my creativity going with alcohol free beverages. Every drink is possible here, as long as it is not alcoholic. I will start with some homemade juices, but also hope to be able to show some alcohol free fermented beverages. Very exciting! Apart from my blog resolutions, I also want to create more home brewed beers, along with moving on my cider project. As my home-brewery is almost fully working now, I can’t wait to tell you more about new beer recipes and tricks to make even better home brewed beers. Are you ready? Let’s start the new year with even more beverage creativity :-). The fresh apple juice I made this year was not only used for drinking the juice, but also as the main ingredient in my ciders. It is the second time I make cider, so I wanted to experiment a bit more to get different flavors. I had around 35 liter left after I pasteurized the juice just to drink. That was enough to divide it in two and make two different ciders types. The first cider I am making is a regular dry cider without any additives. For this one, I only used the freshly squeezed apple juice. I poured the juice in my fermentation bucket and added a Torulaspora delbreuckii yeast (Prelude from Chr Hansen). This yeast can ferment up to 12-13 percent of alcohol, so that is fine as my cider will be maximum 7% alcohol (v/v). The Torulaspora gives a more full-bodied cider with a fresh fruity aroma. The fermentation was done at 17 degrees Celsius, to have a slower fermentation, resulting in more fruity flavors. Tasting after fermentation showed a dry clean cider taste with crisp fruity flavors. For the second cider, I used honey as extra sugar source. This results in a more sweet cider with higher alcohol percentage. The final alcohol will be around 13 % (v/v). 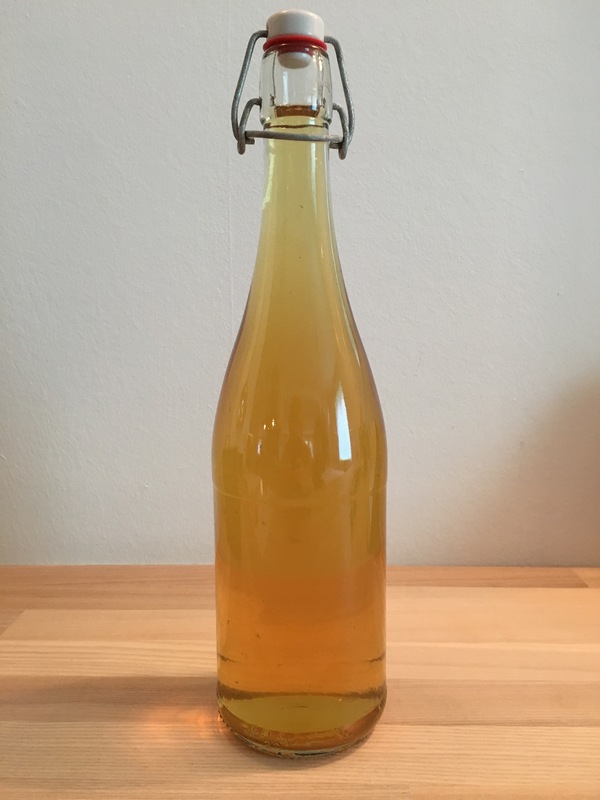 To make this cider, I dissolved 4 kg of honey in 8 liter water. I dissolved the honey by warming up the water up to boiling temperature. In this way the honey also gets sterilized, making sure no wild yeast or bacteria can take over the fermentation. I also used the Torulaspora delbreuckii to kick-start the fermentation, but I added a normal Saccharomyces wine yeast (Jazz from Chr Hansen) after 5 days of fermentation. After fermentation, the taste was clearly more fruity, flowery and sweet than the cider with apples alone. The honey definitely gives an extra sweet touch to the taste and more fruity/flowery aroma to the cider. That combined with the better mouthfeel from the Torulaspora will definitely result in a winner cider. Do you also have spirits in your cupboard that you are sure of you will never drink them. Or did you buy the wrong gin and now it’s just taking up space in your bar cupboard? Well, then I have a solution for you: pimp them up with fruit or flowers so you can actually serve them for your friends and family as an aperitif. Or you can use them in your baking experiments. It is very easy to start such an experiment. Find at least half a liter of spirit, and this can literally be anything. The best ones are the most neutral spirits (meaning not so much flavor) like gin or vodka for example. Then choose your fruit or flower. I will show two recipes I made: plum gin and elderflower spirit mix. For the plum gin I used a very cheap gin I had standing in our cupboard as a faulty buy. I had plums in my garden last year, the very small ones called ‘mirabelle’. I picked a small amount of them and washed them thoroughly. Then I added them in a jar and added 5 spoons of sugar. At last, I filled up the jar with the gin. 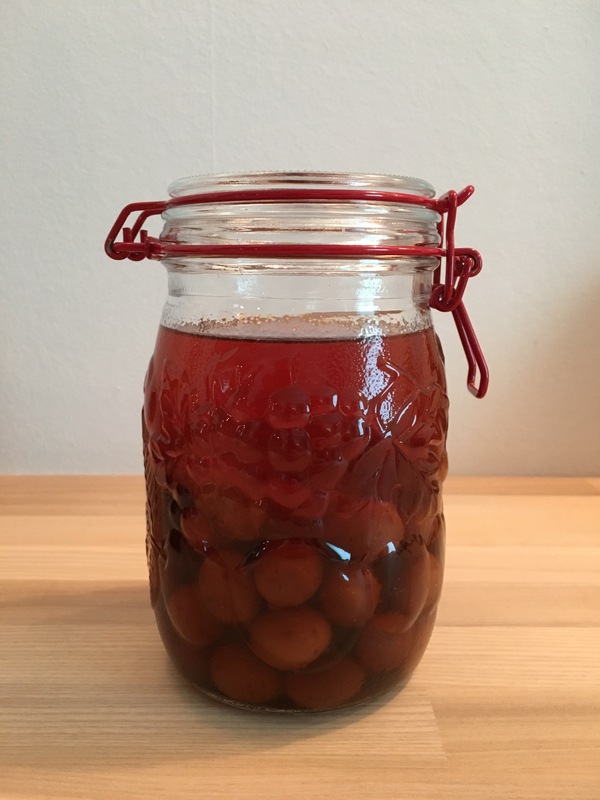 After 10 months I tasted the plum gin and it tasted delicious! The gin also took the color of the plums. After I opened up the jar, I actually filtered the gin through a cloth and put the plums and filtered gin in a new jar. Excellent to serve in small glasses with a plum or two as aperitif. The plums have taken a lot of alcohol and are the best part :-). 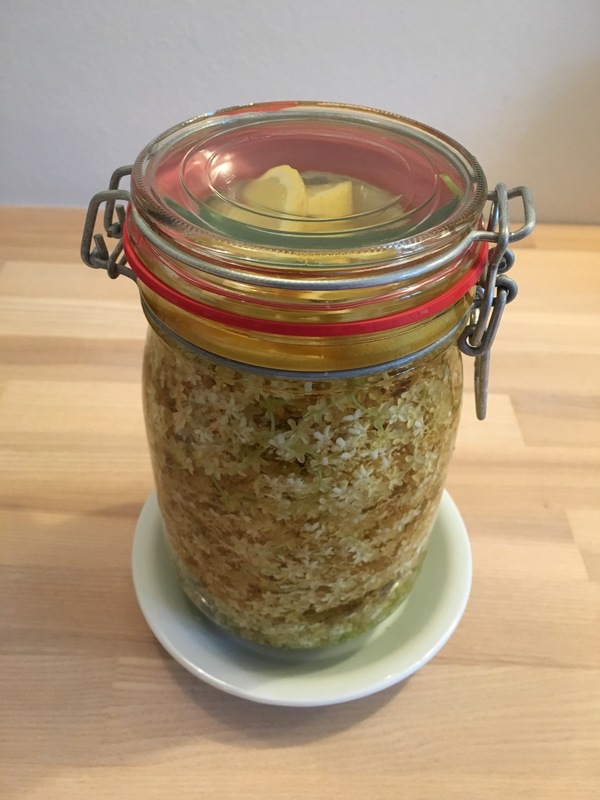 My second recipe is an elderflower spirit mix. For this experiment I used elderflowers from my garden. Pick them when they are ready. Preferably in the morning as they have the strongest smell at that time. Wash them thoroughly and add them in a jar. Add again some spoons of sugar, depending on how sweet you want it. Fill up the jar with the spirits you have available. I used vodka and a leftover of jenever. Finish off with lemon in pieces and make sure you cover all flowers. If not, the flowers will brown because of oxidation. Leave for at least two weeks and taste regularly. Whenever you feel no more extra flavor is extracted, sieve the flowers out of the spirit. Put in a nice bottle and start serving :-). sofiesaerens on Let’s get 2019 started! Bostonbaby on Let’s get 2019 started!